Roland Chanliaud looks up from the tiny counter of his open kitchen and beams as you enter the restaurant of La Maison du Colombier in Beaune. For years Chanliaud was the wizard in the kitchen at Le Jardin des Remparts, a restaurant known for its classic cuisine though decidedly not for the warmth of its accueil. Now he and his new wife preside over this self-styled gastro-bar, housed in an ancient tower with five rooms to let and a terrace that attracts a jolly crowd in temperate weather. 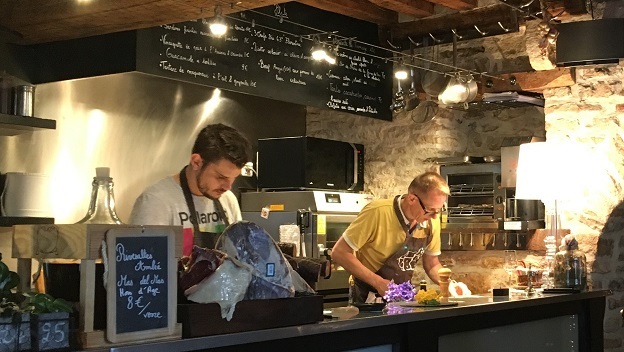 The Colombier sits at the center of town, just a few blocks from Chanliaud’s old digs on the Péripherique, but it’s leagues away in terms of culinary mood and approach. From their cluttered station, the chef and his sous-chef, Bertrand Gueucier, send forth a stream of wondrous tapas-style dishes, all the while chatting up the customers perched on bar stools at several raised tables that crowd the wood-beamed main room (a few steps down, two very snug low-slung rooms have been carved out of the thick stone walls). Now and then he stops at a table to joke with regulars and recommend specials. You sense Chanliaud’s ebullience and spontaneity in the chalkboard list of dishes that change daily, and you can taste those qualities in his clean, spare preparations of charcuterie and fish, served family-style on wooden cutting boards and thin sheets of slate. The place hums with conviviality. Ingredients here sparkle: glistening raw herring, bright orange-yoked eggs, split red berries on a row of sardines. 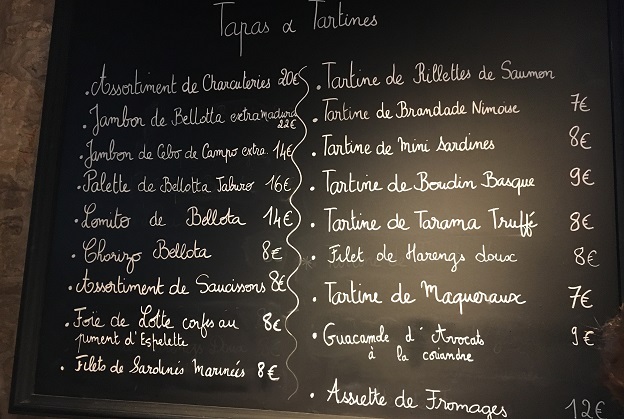 Prices are moderate (ranging from 20 Euros for an assortment of charcuterie down to a healthy number of 7- to 9- Euro plates of tartines piled high with marinated fish). Our table of four sampled liberally according to the chef’s recommendations and our own rapacity. 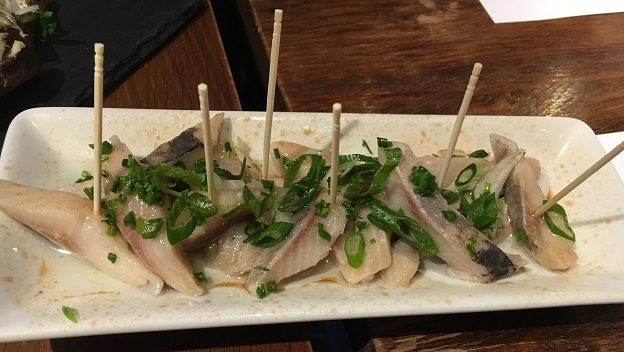 Here’s the procession of dishes we shared: Silken tranches of herring topped with scallions and a drizzle of olive oil. “Gateau” squares of foie blanc, pooled in a tomato concasse, the liver whipped and molded to velvet density. 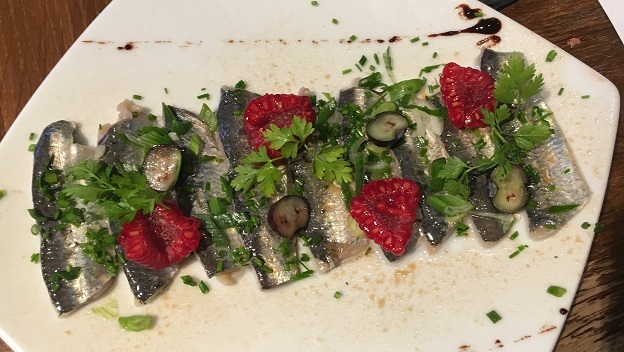 Sardines sprinkled with raspberries and blueberries, whisps of chervil and sea salt. Guacamole à la Basque, the avocado (unencumbered by tomato or onion) enlivened by coriander and piment d’espelette, a ground red pepper from southwest France with a distinctively hot/sweet piquancy. 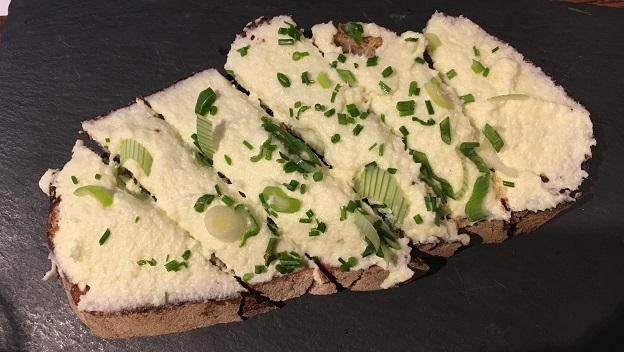 Resiny-smoky brandade nîmoise—a smooth spread of salt cod in the style of Nîmes—served on crusty toasted baguette. 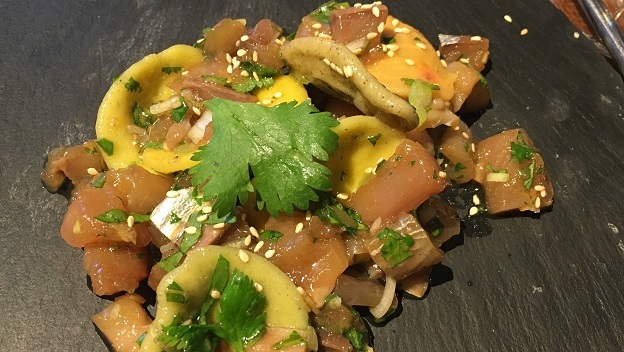 Melting chunks of mackerel tartare, accompanied by large chewy rondels of pasta, the whole napped in a soy-sesame oil dressing with notes of ginger and cilantro. 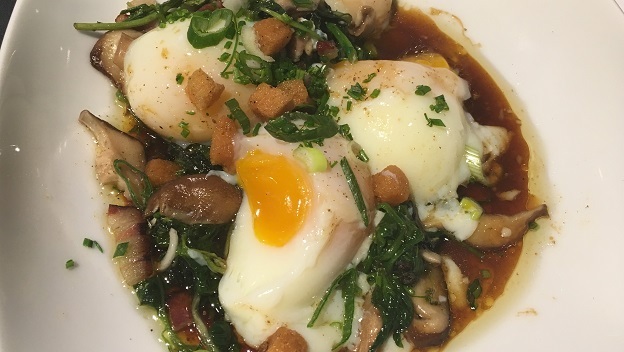 Then there were the eggs, from the nearby organic Ferme de la Ruchotte, and not just your farm-fresh variety, but eggs issuing directly from hens that are personally known to the chef, who gives them his “63-degree” treatment: slow cooked to the point of gelled divinity, enrobed in a meaty shiitake mushroom reduction, bestrewn with little oil-softened croutons, and nestled on a low bed of greens. The dishes here are sufficiently varied and full-flavored to stand on their own, but this is Burgundy and that would be tragic. Chef Chanliaud has spent many years cultivating relationships with local wine producers and his carte des vins will make you moist. Beyond a who’s who of the top producers of the Côte d’Or and Chablis, Chanliaud offers an outstanding selection of grower Champagnes as well as top bottlings from the Rhône and Loire valleys and elsewhere in France. I suspect that many visiting enophiles lose all control here and simply stagger upstairs afterwards to their rooms in Chanliaud’s gîte urbain. While the list is chockablock with cult producers (e.g., Vincent Dauvissat, Dugat-Py, Dujac, Lafon, Leflaive, Lucien Le Moine, D’Angerville, Leroy, Méo-Camuzet, Mugneret-Gibourg, J-F Mugnier, Raveneau, Roumier, Rousseau et al. ), there are also many excellent and extremely affordable bottles from unusual suspects. And while lots of other local restaurants merely pay lip service to the great names with the odd village wine or lesser vintage, at Maison du Colombier you’ll find top cuvées­, from village to grand cru level, not to mention older vintages and mini-verticals of some of France’s most lusted-after collectibles (eight vintages of Lafon’s Meursault Perrières, six vintages each of Vincent Dauvissat’s Chablis La Forest and Dagueneau’s Pouilly-Fumé Pur Sang, and the like). 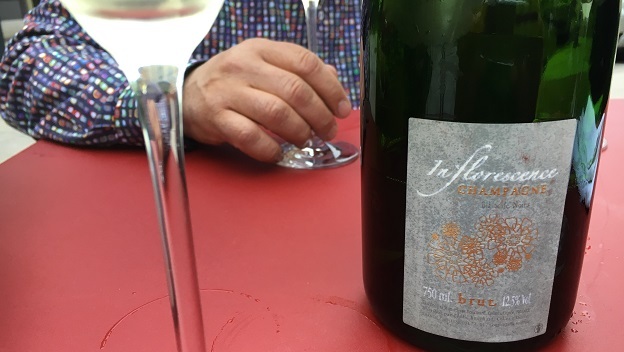 We began our meal outdoors with Cédric Bouchard’s extraordinary entry-level bottling, the Champagne Inflorescence Blanc de Noirs, which, along with his pricier single-vineyard, single-vintage, single-variety wines, has drastically improved the reputation of Champagne’s southerly Aube region for high-quality Pinot Noir. This superb value provides a rare combination of concentration, structure, ripe fruit and taut minerality, and it’s hard to imagine a more food-flexible liquid. We enjoyed it with bread and tapenade but it would have gone well with all of our oily and salty fish dishes, and I’d love to have tried it with jambon de Bellota, which is also on the menu here. 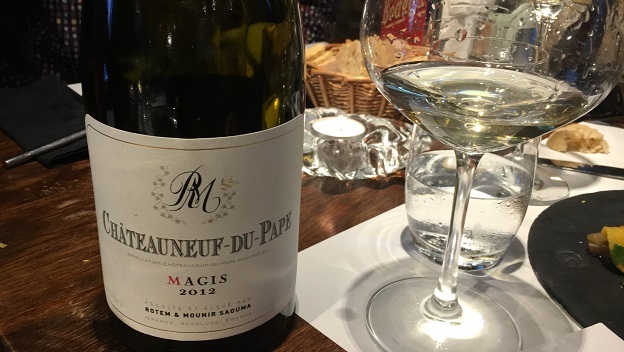 We then moved on to Rotem & Mounir Saouma’s 2012 Châteauneuf-du-Pape Magis, a large-scaled, honeyed yet vibrant white wine with the palate presence, smoky depth and minerality of a top Burgundy cru (from the same husband-and-wife team responsible for the Lucien Le Moine wines in Beaune). Its salinity, suavity and silkiness made for a perfect match with the foie blanc and salt cod. Our desserts at La Maison du Colombier were light and refreshing, welcome choices after a repast weighted heavily on the side of protein. Two standouts: Clafoutis la pistache was served with tonka ice cream, the tonka bean imparting an exotic blend of spicy-caramel-vanilla to the almond-pistachio cake; and Cremeux au citrons Corse, a bracing circlet of lemon curd on shortbread, crowned with lemon chantilly and grated green lemon zest. Put this place at the top of your list for your next visit to Beaune.